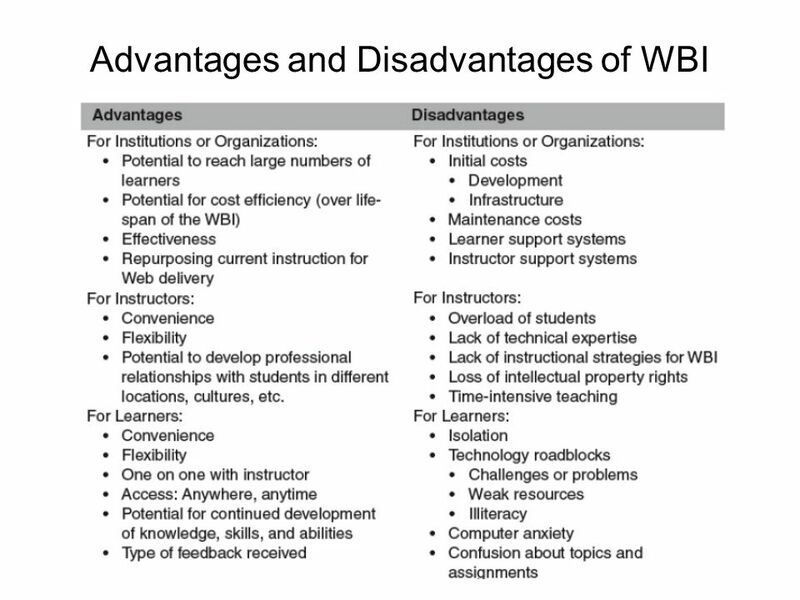 2 Defining Web-Based Instruction Instruction via Internet and Intranet only. Synonymous with online learning. 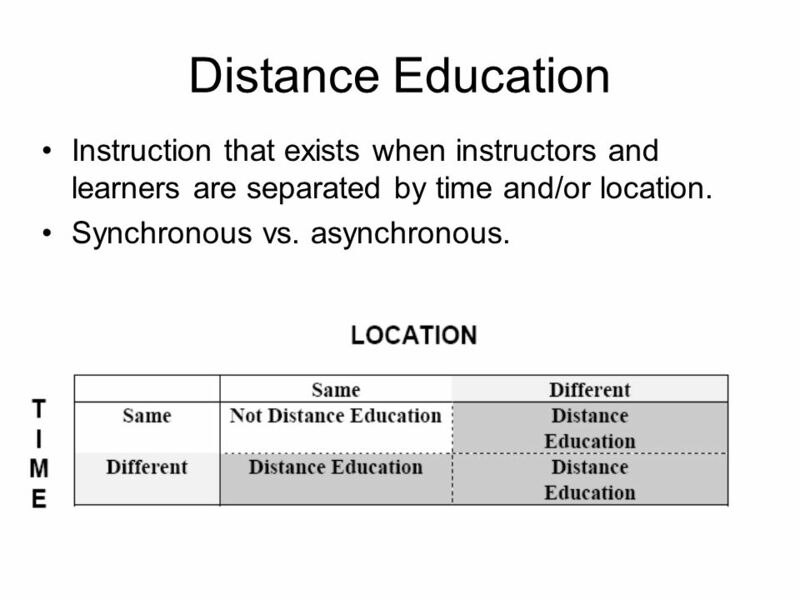 3 Distance Education Instruction that exists when instructors and learners are separated by time and/or location. Synchronous vs. asynchronous. 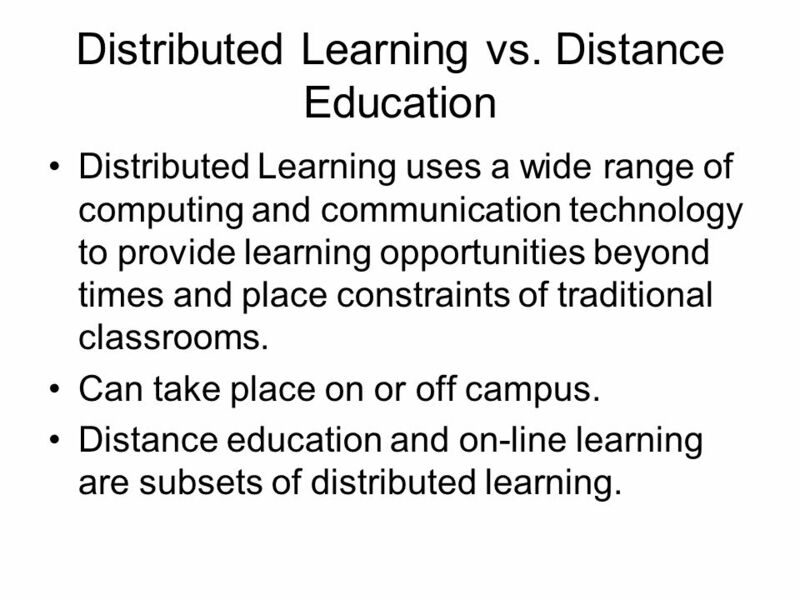 4 Distributed Learning vs. Distance Education Distributed Learning uses a wide range of computing and communication technology to provide learning opportunities beyond times and place constraints of traditional classrooms. Can take place on or off campus. 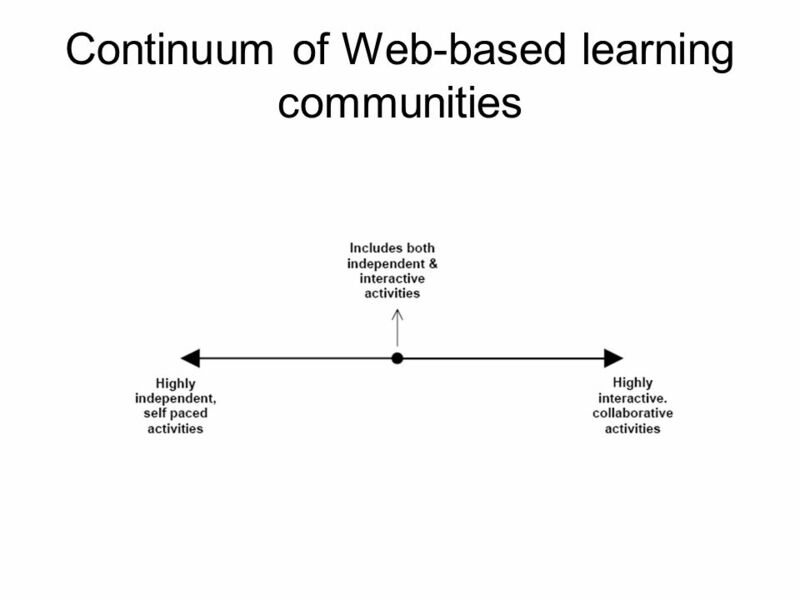 Distance education and on-line learning are subsets of distributed learning. 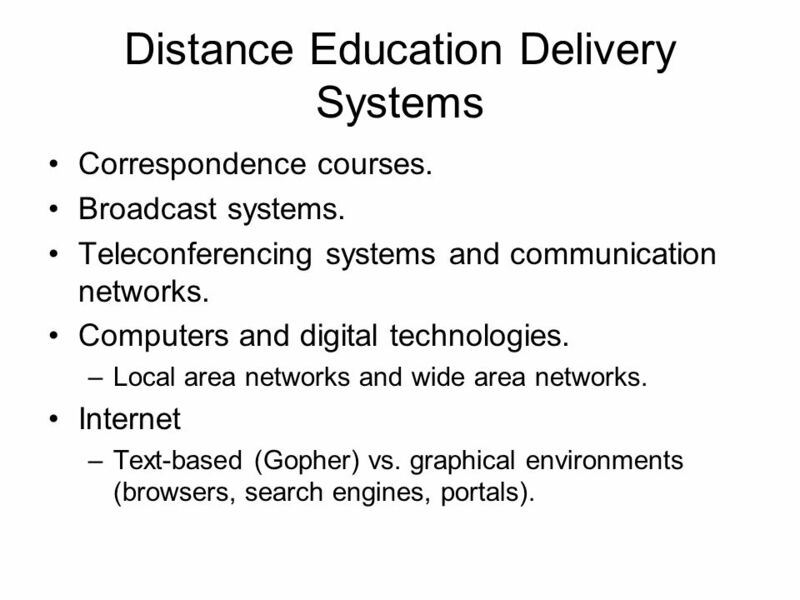 5 Distance Education Delivery Systems Correspondence courses. Broadcast systems. 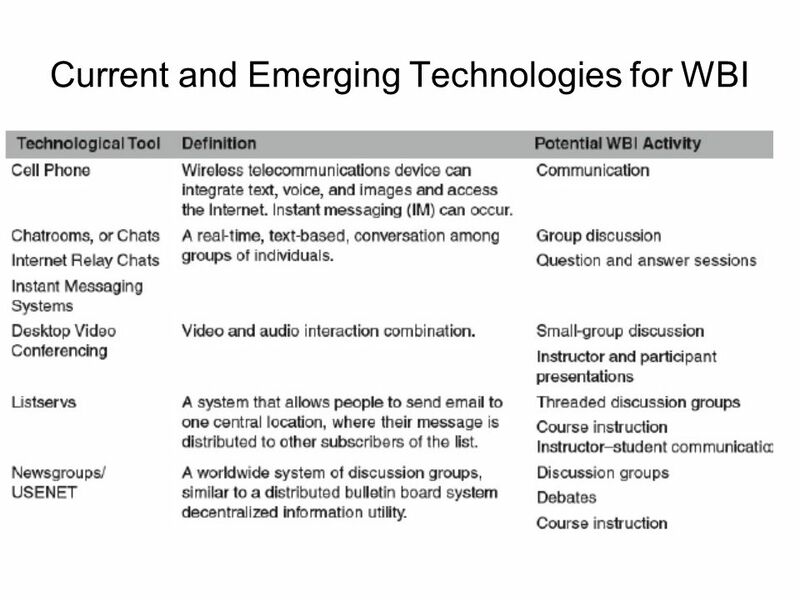 Teleconferencing systems and communication networks. Computers and digital technologies. –Local area networks and wide area networks. Internet –Text-based (Gopher) vs. graphical environments (browsers, search engines, portals). 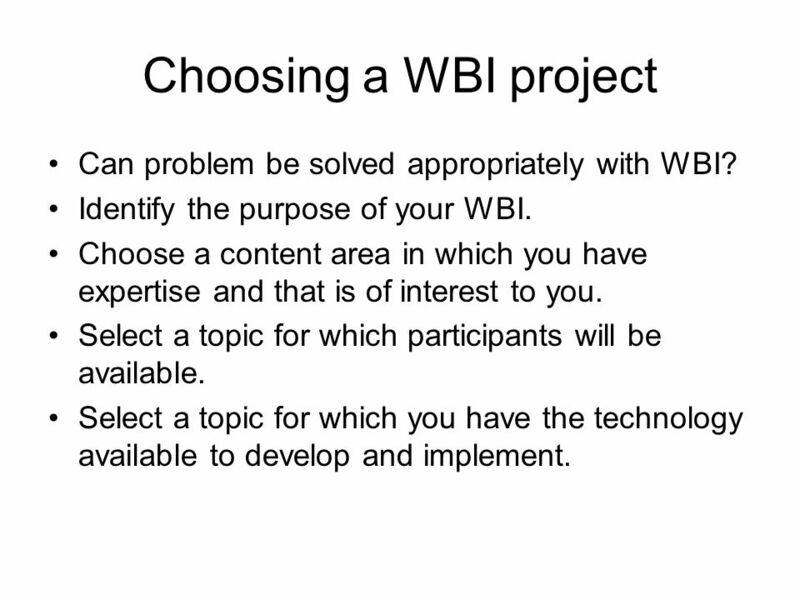 7 Choosing a WBI project Can problem be solved appropriately with WBI? Identify the purpose of your WBI. Choose a content area in which you have expertise and that is of interest to you. Select a topic for which participants will be available. 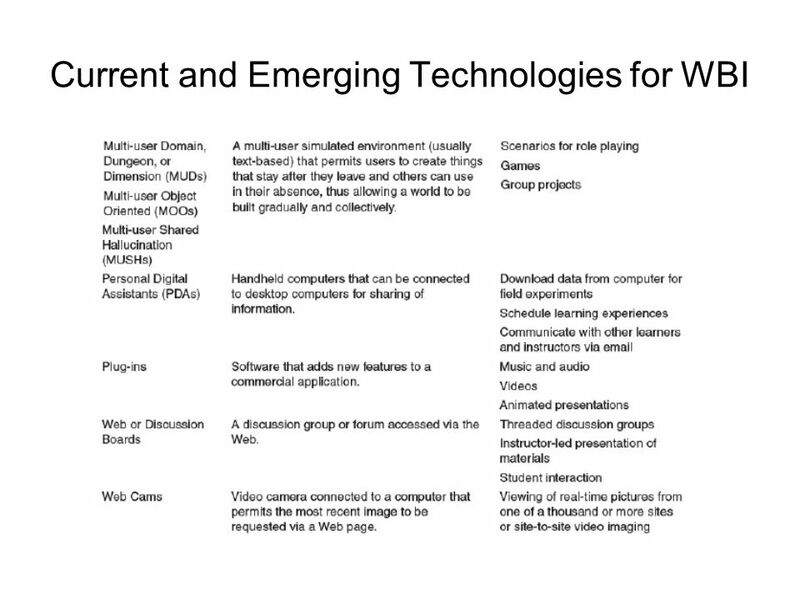 Select a topic for which you have the technology available to develop and implement. 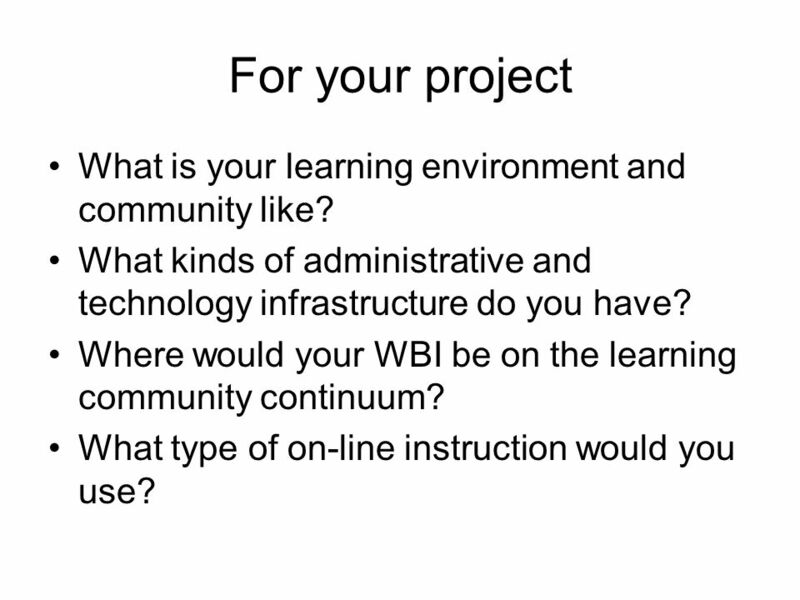 11 For your project What is your learning environment and community like? What kinds of administrative and technology infrastructure do you have? 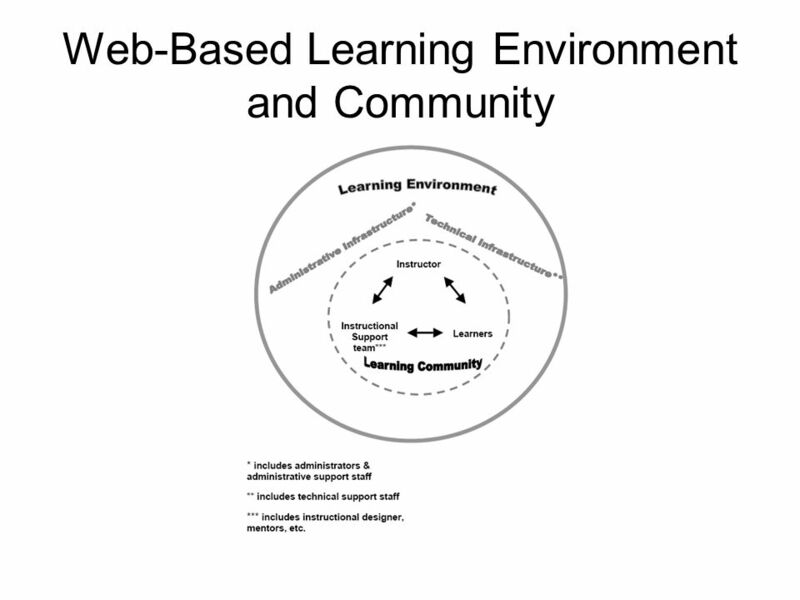 Where would your WBI be on the learning community continuum? 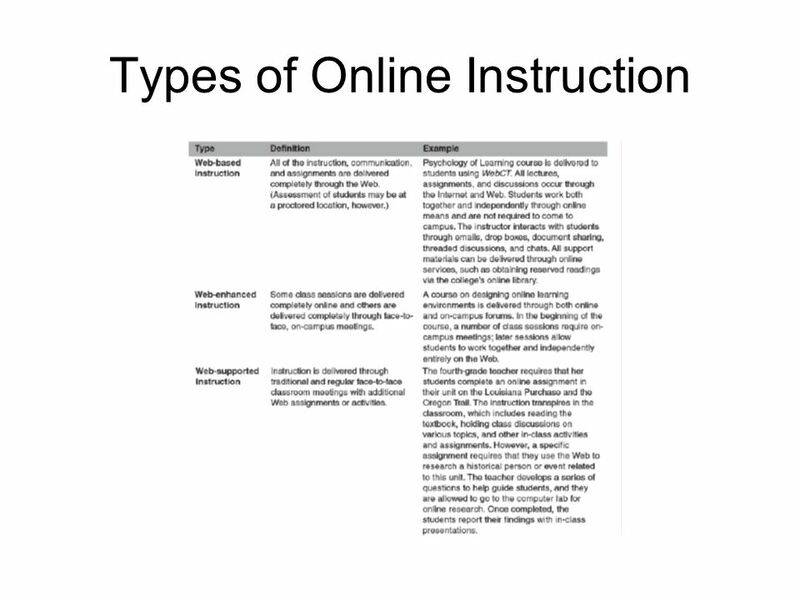 What type of on-line instruction would you use? 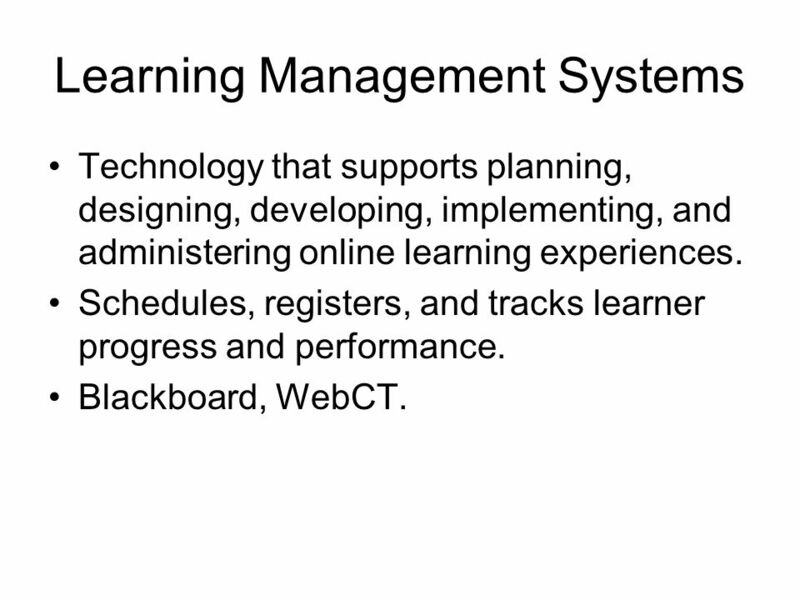 14 Learning Management Systems Technology that supports planning, designing, developing, implementing, and administering online learning experiences. Schedules, registers, and tracks learner progress and performance. Blackboard, WebCT. 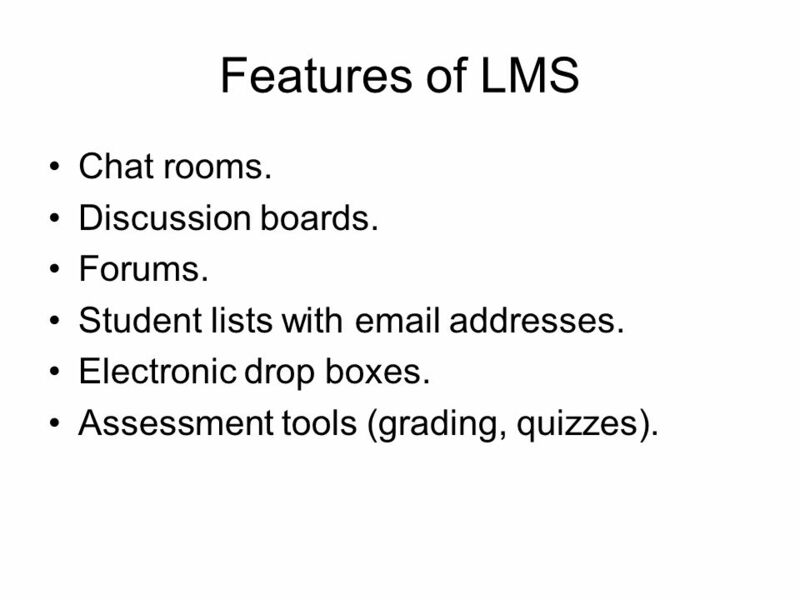 15 Features of LMS Chat rooms. Discussion boards. Forums. Student lists with email addresses. Electronic drop boxes. Assessment tools (grading, quizzes). 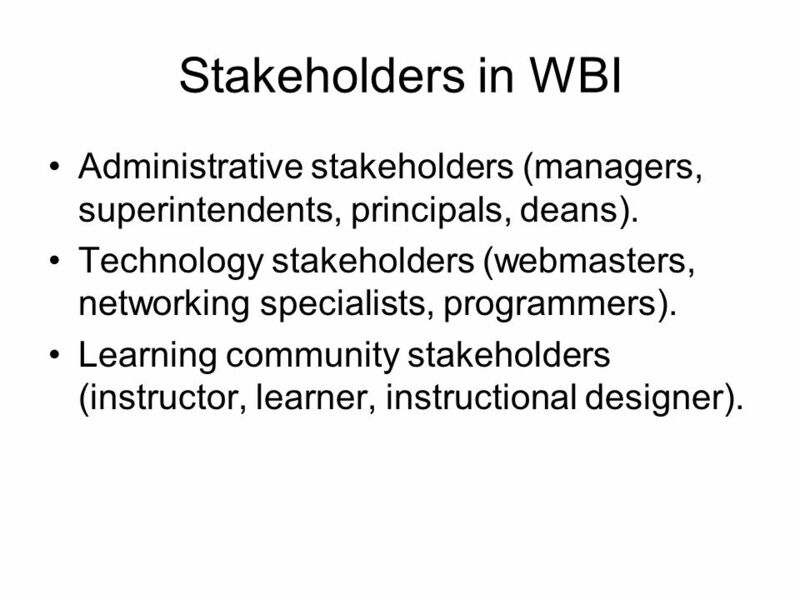 16 Stakeholders in WBI Administrative stakeholders (managers, superintendents, principals, deans). Technology stakeholders (webmasters, networking specialists, programmers). Learning community stakeholders (instructor, learner, instructional designer). 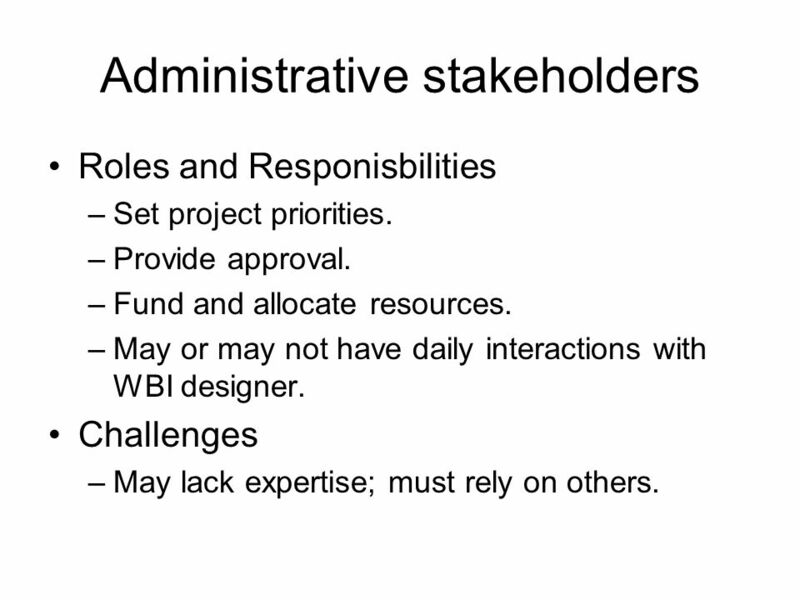 17 Administrative stakeholders Roles and Responisbilities –Set project priorities. –Provide approval. –Fund and allocate resources. –May or may not have daily interactions with WBI designer. Challenges –May lack expertise; must rely on others. 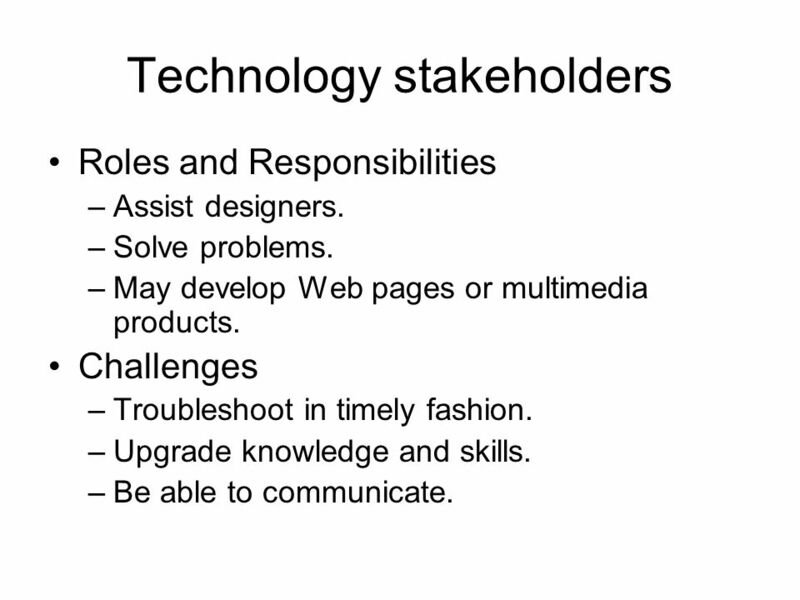 18 Technology stakeholders Roles and Responsibilities –Assist designers. –Solve problems. –May develop Web pages or multimedia products. Challenges –Troubleshoot in timely fashion. –Upgrade knowledge and skills. –Be able to communicate. 19 Learning Community stakeholders Instructor Roles and Responsibilities –Establish the learning community, set the tone. –Lead teaching using good teaching practices. –Be available. Instructor Challenges –Expectation of immediate feedback. –Volume of learner contacts. –Keep current with technology. 20 Learning Community stakeholders Learner Roles and Responsibilities –Participate! –Help establish goals and community. –Self-motivation, good study skills. Learner Challenges –Feelings of isolation. –Issues involved with becoming a self- regulated learner. 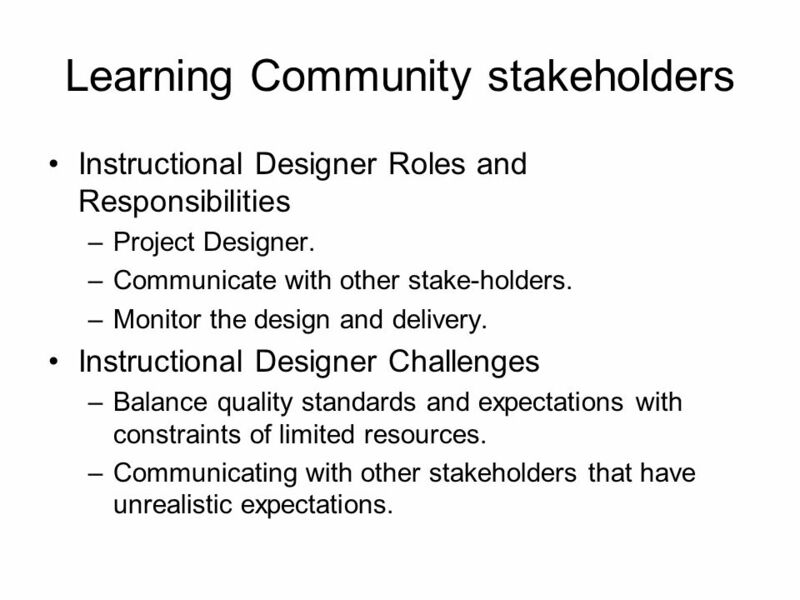 21 Learning Community stakeholders Instructional Designer Roles and Responsibilities –Project Designer. –Communicate with other stake-holders. –Monitor the design and delivery. Instructional Designer Challenges –Balance quality standards and expectations with constraints of limited resources. –Communicating with other stakeholders that have unrealistic expectations. 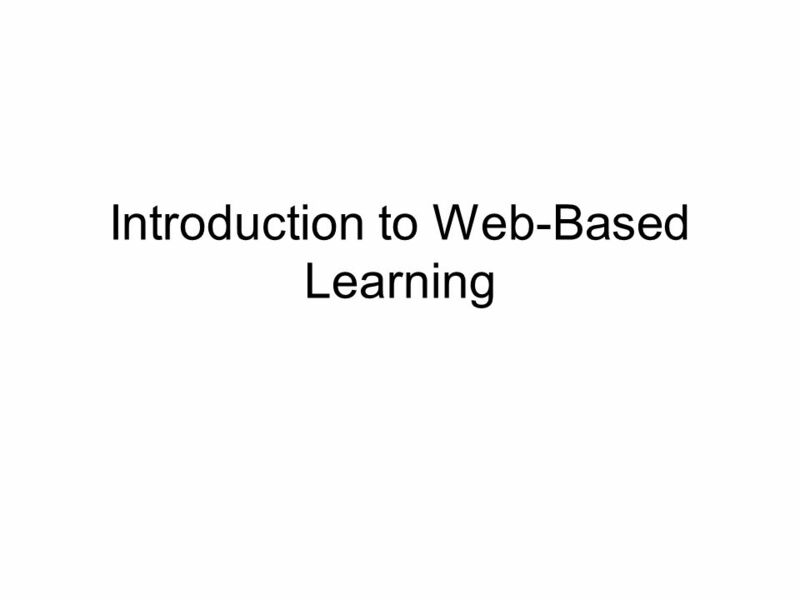 Download ppt "Introduction to Web-Based Learning. 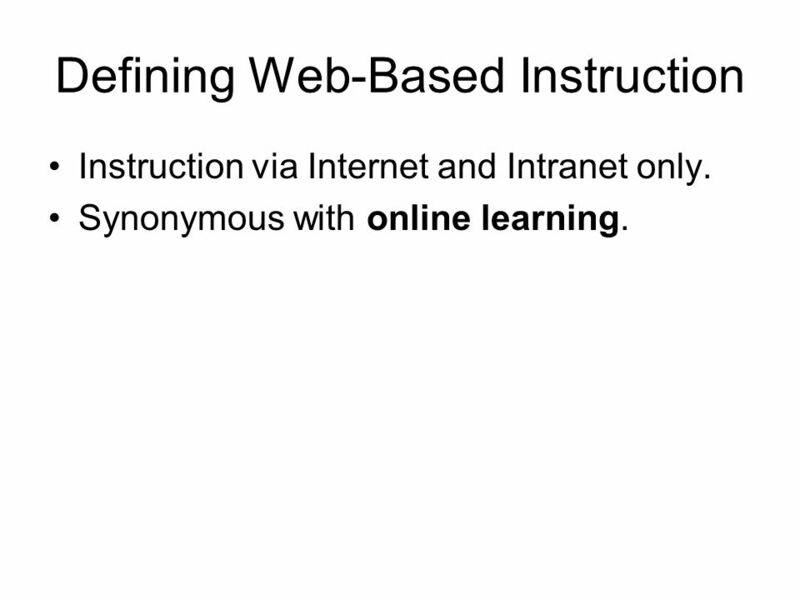 Defining Web-Based Instruction Instruction via Internet and Intranet only. Synonymous with online learning." School in a Virtual Shoebox Using A Learning Management System in Your School. Student Orientation for Distance Learning Central Piedmont Community College Distance Learning. INTRODUCTION TO E-TUTORING. TOPICS TO BE COVERED: Definition of an etutor What is and etutor? Who is an etutor? Competencies required Role of the traditional. Enhancing Electrical Engineering Education by Developing Online Courses M. Mohandes, M. Dawoud, A. Hussain, M. Deriche, A. Balghonaim Electrical Engineering. Planning a Web-based Course Barbara Lockee Office of Distance Learning Department of Teaching & Learning. New Faculty Orientation Blackboard Academic Suite 7.1 University of the Pacific June 28, 2015. Implementation Challenges And Strategies Of An Organization Deploying A Synchronous Online Learning Environment Joselito C. Olpoc. Distance Learning Today 1 New York is no nearer or farther than Beijing, Old constraints of time and space are not relevant on the Internet.